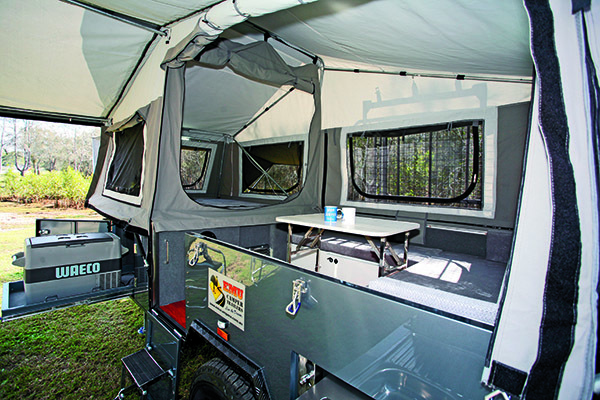 Emu Camper Trailers builds a range of campers, everything from lightweight trailers to something for the traveller who wants to tackle some serious tracks. A recent arrival in the Emu stable in the latter category is the Desert Series 2 Forward Fold model. 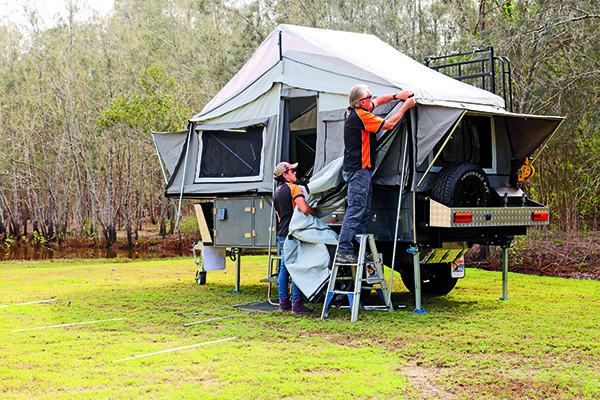 Unlike some of the other Emu models, which are built partly in China and partly here in Australia, this camper is fully assembled in China. Emu has learned the value of specifying exactly what it wants from its Chinese suppliers. 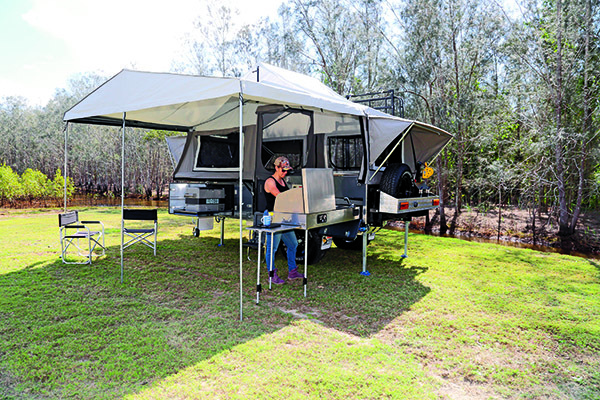 The Desert Series 2 is built to a familiar forward-fold design, with a main body section measuring 2040x1890mm sitting on a hot-dipped galvanised, 100x50mm-railed chassis. Built for offroad use, the camper has a full independent suspension setup with trailing arms, coil springs and two shock absorbers per wheel. The 12in electric brakes are fitted to the 16in alloy wheels. This gives a good ground clearance and departure angle even with the rear-mounted, alloy checkerplate protected 120L water tank underneath. There is a good selection of storage compartments built into the trailer. 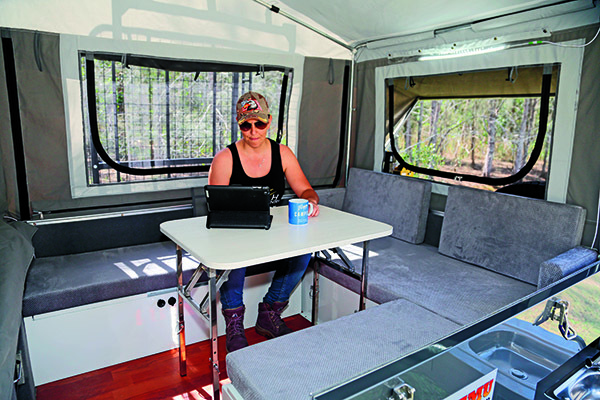 Some are dedicated, like the rear slide-out kitchen and the front-fitted ventilated fridge box but many can be used for extra storage, whether the camper is opened up or not. The slide-out drawers fitted into the mid-section bin are particularly handy and can be used from either side. Like in similar designs, the ball weight is a consideration in this camper. Unladen, it comes in at around 150kg but loading up the trailer is certainly going to change that. In addition to the front storage boxes, filling up the gas cylinders, jerry cans and the second 35L water tank will all add to the drawbar weight. But having the rear water tank full will balance things up a bit. Setting up the Desert Series 2 in its basic form is quite simple. Four corner stabilisers are used to level the trailer and then it’s a matter of unclipping the trailer top clip and hinging the top over. Boat-style winches are fitted fore and aft for opening and closing the camper but it’s relatively easily done by hand. Measuring 4230x1800mm and with a height of 2100mm, the main tent comes standard with a tropical roof. All the screened windows have zipped clear plastic inserts and, except for the under awning windows, deep canvas hoods on the outside. They are positioned by extendable struts. I could be nit-picking here but it seems to me that the plastic window openings are upside down. Rolling up, as they do, means they have to be either open or closed. If they were the other way around, it would be easier to leave them half open. The 4230x2200mm awning is a welcome extension that’s easily attached to the main tent – but a small step ladder definitely comes in handy here! The supplied canvas wall encloses the entire under area, and there’s also an ensuite/shower room that attaches to the front wall included in the package. That’s quite an extensive under-canvas area. Now for the all-important catering department: the kitchen is well set up with the slide-out stainless steel kitchen bench that has a sink and drainer and a four-burner cooktop minus a grill. Shielded by a two-sided windshield, the burners are well-sized to accept large pots. A gas bayonet and a 12V outlet for wand-style LED are located to the camper side. The chest fridge appearing in the photos isn’t standard, but it demonstrates the good size of the fridge slide-out. An easy clamber up two steps provides access through a door flap to the interior. The bed is found in the forward end. Surrounded by screened windows on all sides, the good-sized innerspring mattress measures 2200x1860mm; a welcome addition, as RVs and caravans frequently have smaller beds. When alfresco living is off the cards, the interior lounge area will accommodate three or four people without too much trouble. Being in the trailer base, the seats are set fairly low but so is the freestanding table. Flat cushions are used all round. 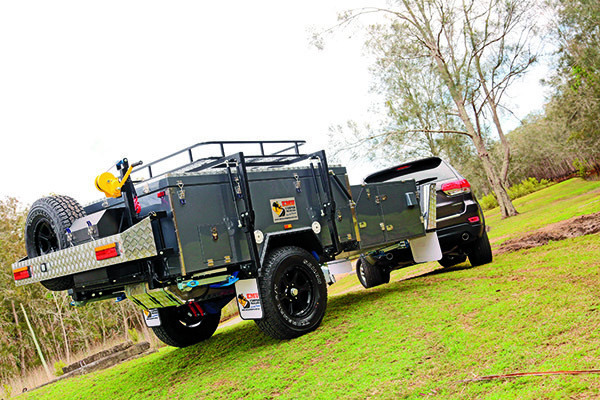 The Emu Desert Series 2 Forward Fold is a well-appointed camper trailer, in my opinion. It has just about everything you might need for a week away. The only extras you may need are personal gear, bedding and food. Being a forward-fold unit, it’s relatively easy to set up, especially for a quick overnighter. Of course, for longer stays, the Desert Series 2 can be well organised for a comfortable campsite, which makes it an attractive all-round proposition, especially for the price.